Consider the breed when assessing vertebral heart score in dogs. Thoracic radiography often provides the first glimpse of cardiac structures in dogs being evaluated for potential heart disease. Though an important diagnostic tool, the mostly subjective nature of radiographic review poses a challenge when evaluating the heart. Subjective impressions of heart size can be influenced by the relationship between the cardiac silhouette and the surrounding lung fields, with smaller lung fields contributing to an impression of a larger cardiac silhouette. Expiration and chest conformations that obscure lung field visibility may thereby lead to false assessment of an enlarged cardiac silhouette. Assessment of vertebral heart score (VHS) can minimize subjective challenges by assigning an objective value to heart size based on the patient’s vertebrae (Fig. 1). Figure 1: Determination of vertebral heart score (VHS) on right lateral thoracic radiograph view. The long axis measure is taken from the ventral aspect of the carina to the cardiac apex. The short axis is perpendicular to the long axis at the level of the caudal vena cava. Both long axis and short axis measurements are aligned with vertebral column starting at beginning of T4 vertebra to obtain VHS. 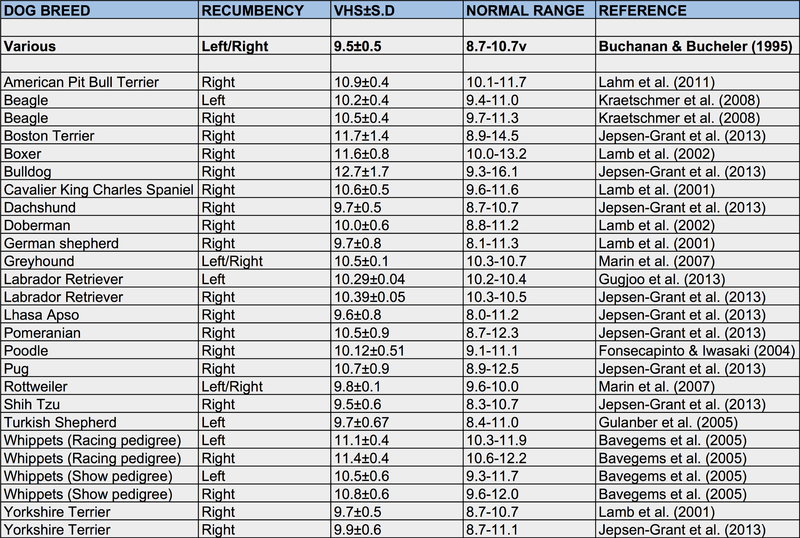 A normal VHS range of 8.7 – 10.7 vertebrae was first established in the original description of the VHS method across a variety of dog breeds and chest conformations.1 Further study has revealed that some dog breeds, particularly those that are small, brachycephalic, or chondrodystrophic, exhibit VHS ranges that are significantly larger than other breeds.2 Application of the original VHS normal ranges for dogs would lead to false conclusions of increased cardiac silhouette size in these breeds. For some breeds, this may be due to differences in the relationship between vertebra length and heart size. Other breeds exhibit a greater incidence of vertebral abnormalities, including hemivertebrae, that shorten vertebral length and increase normal VHS ranges. As such, it is important to consider breed-specific VHS reference ranges when evaluating cardiac silhouette size in dogs (Table 1). Table 1: Compilation of breed-specific VHS reference ranges. Ultimately, VHS remains one of several potential radiographic assessments of the heart. Though radiographic evaluation of the heart is limited to its silhouette, certain chamber enlargement patterns can be more specific for heart disease than VHS. In particular, evidence of left atrial enlargement on radiographs would supersede a concurrent normal VHS in raising concern for potentially significant left heart disease. Pulmonary venous enlargement can also be similarly significant when evaluating for heart disease. However, serial VHS measurements can aid in long term monitoring of progressive heart disease. 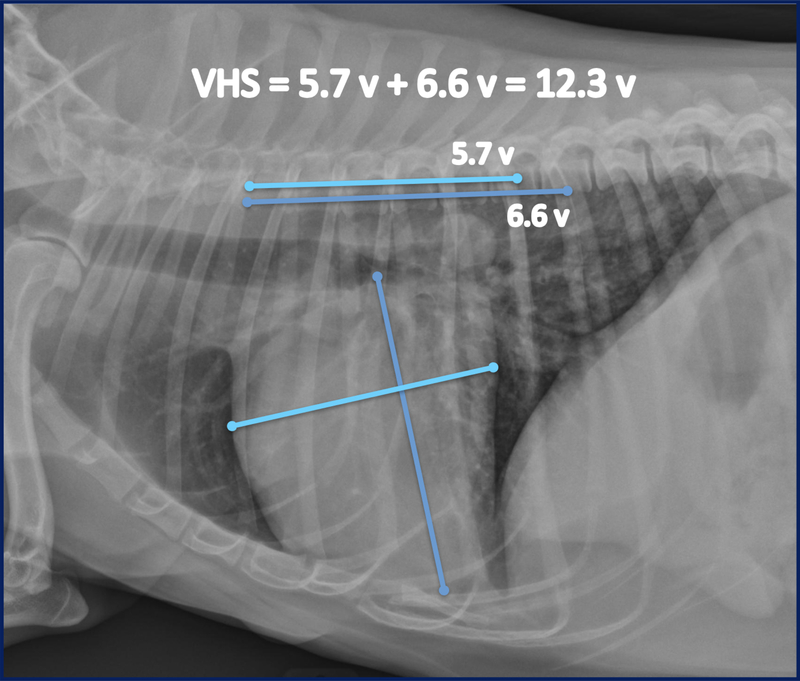 Thus, VHS can be a powerful tool in assessing the heart in dogs when used alongside evaluation of chamber enlargement patterns, inspection of pulmonary vessel sizes, and accounting for breed-specific reference ranges. Buchanan JW, Bucheler J. J Am Vet Med Assoc. 1995 Jan 15;206(2):194-9. Jepsen-Grant K, Pollard RE, Johnson LR. Vet Radiol Ultrasound. 2013 Jan-Feb;54(1):3-8.